Here is a list of Best Free Gerber Viewer Software for Windows. These software let you open and view Gerber files (GRB files) with the help of their extensive tool set. 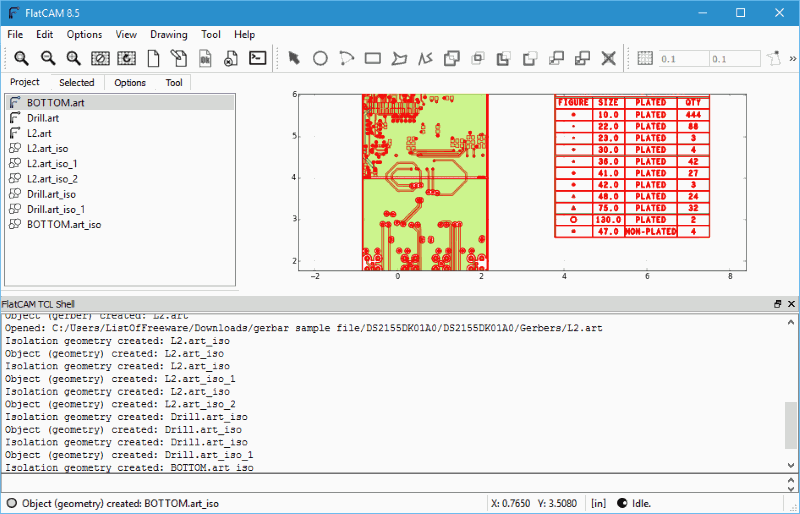 Some of the software listed below are Gerber editor software as well, and let you view as well as make changes to Gerber PCB designs. 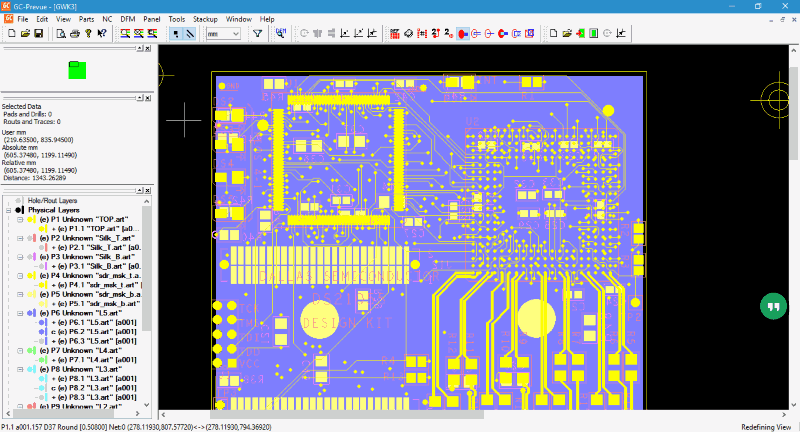 PCB design in Gerber files are made of various layers of components, copper, traces, etc. ; these layers can be separately viewed with these Gerber viewer software. You can zoom, rotate, flip, and move the designs for enhanced view. 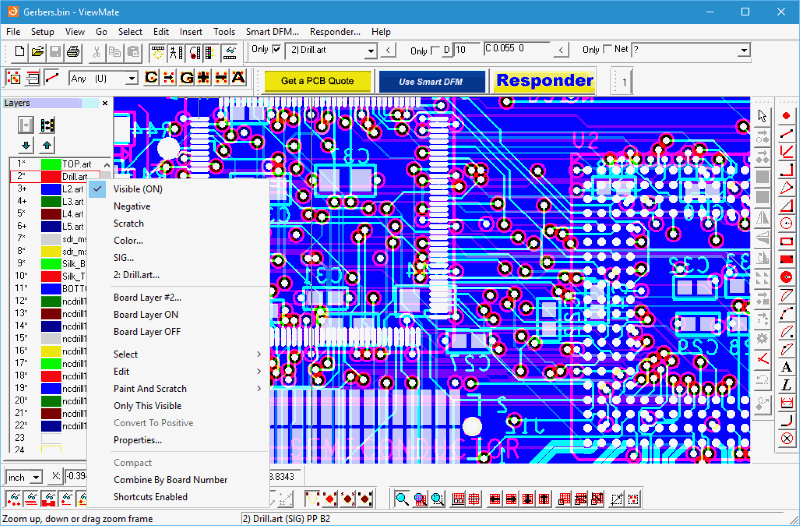 Some of these software also let you view top and bottom view of PCB design layers. Another feature that most of these software have is that they let you find the distance between two components in mm/cm/inches. Use these Gerber file viewer software to export the design in various formats, like: SGV, PDF, PNG, PDF, JPEG, etc. Take a print out of the design if you want. To know more about these software to view Gerber files, read the brief description of the listed software. You will also know how to open Gerber files with the listed software. GerbMagic is a free, simple, and feature rich Gerber Viewer software. It has all the basic tools required to view Gerber files, which include Layered view, zoom, move, align, and Measure tool as well. You can save a Gerber file as raster or vector image formats, like: bmp, eps, pdf, tiff, etc. You can also checkout the list of best free Circuit Design Software, CAD Software, Software To Speed Up Computer. GerbMagic is a free Gerber viewer software with various viewing options available. It lets you play around with Layers of Gerber files. Select layers to view them and deselect to hide. Now, for a proper view, you can Zoom, move, and align the loaded design. Options to mirror and scale are also available. Distance between two objects/points can be measured here. It lets you easily print gerber files. 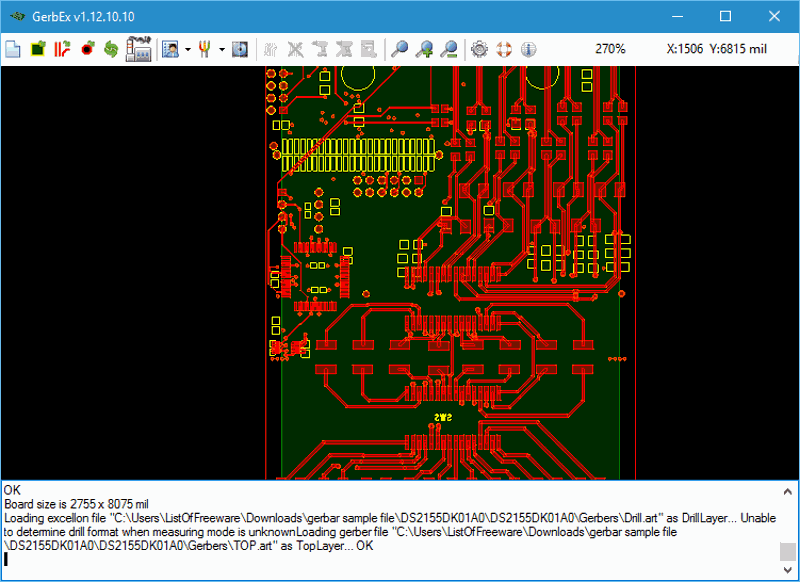 You can open and view the following file types in this software to view GRB files: pcb, gbr, gbw, gbx, pho, art, lgr, and lgx. Open files can be saved as: eps, pdf, tiff, rid, bmp, and gbr. GerberLogix is another simple GRB file viewer for Windows. It lets you easily manage and view various layers of a Gerber file. Layers can be moved up or down manually. It also comes with tools to view all layers, zoom objects, select objects, move objects, etc. You can also measure distance between point to point, object to object, and center to center with this free GRB viewer. Change color of layers and objects for enhanced view. Preview a drawing before you print it. It also lets you export Gerber as tiff, jpg, png, and bmp. You can either export visible area or complete area. GC-Prevue lets you view and print Gerber files for free. Along with Gerber files, it supports and opens almost all common CAD generated drawings. Like every Gerber viewer, it lets you hide layers easily. Option to hide/unhide all layers is also available. Other feature lets you include/exclude lines and points. You can even set unit to measure distance between parts in mm, inches, mils, or microns. Options to select and change colors of various parts, traces/routes, and pads/holes are available. Diagrams can be mirrored along x/y axis, rotated, etc. Layers can be managed by setting layer visibility, deleting layers, and importing layers. In addition to Gerber files, you can open and view gwk, xwk, pwk, cwk, edf, job, and ucm files here. You can change Gerber format and export Gerber files as grb, gbx, ger, art, dpf, drl, nc, hpg, plt, qst, apr, rep, usr, apt, nib, inf, xml, rck, lst, and siz. ViewMate is another good free GRB file viewer. It has an extensive list of tools available for enhanced viewing capability. You can use various selection tools to select components, layer options to hide/delete/add layers, visibility toolbar to change layer/component visibility, and do much more. Select a distance unit from inch, mm, mil, and cm to measure distance between components. Now it lets you add traces/paths to a diagram as orthogonal trace, 90 degrees trace, elbow, circle, add text, etc., but you cannot save the drawing. The drawing with new additions can be however printed. You can play around with the layers of a Gerber file. It lets you change visibility, change color, and stretch layers. You can also add/remove layers and transfer/replicate/swap layers easily. Import Gerber files to workspace along with layers, drill and route, and PDF as vector. 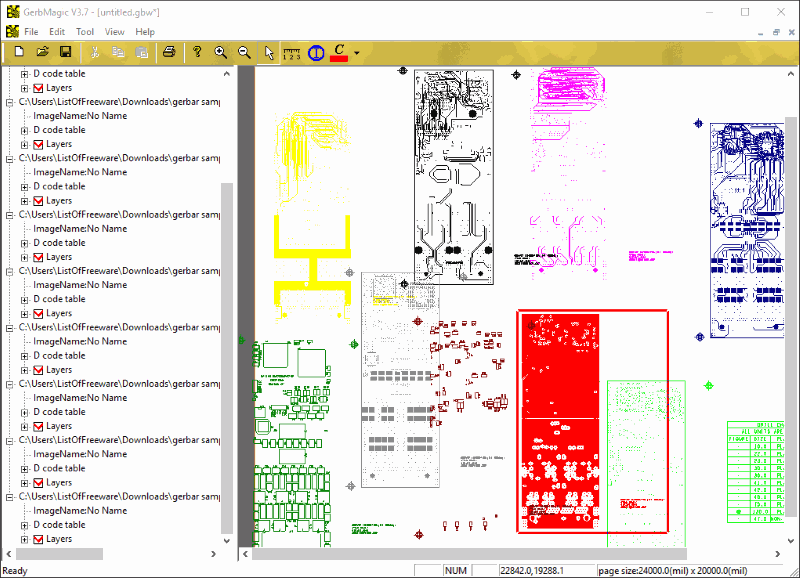 Gerber Viewer is an open source Gerber viewer for Windows. Its is a simple tool with simple viewing options. It lets you import files to view them, and the tools let you see the top view and bottom view of designs. You can view and hide layers by selecting and deselecting them. It lets you import gerber 724-X and IPC2581 files. 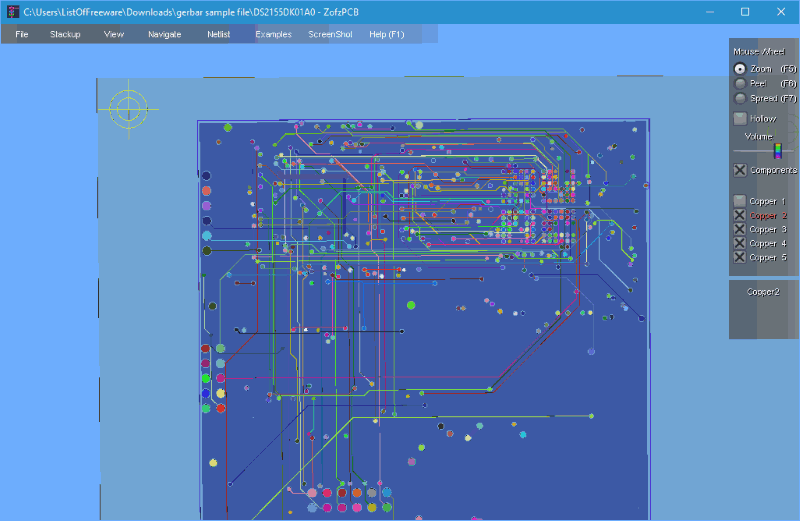 ZofzPCB is an advanced software to view GRB files. It gives you options to peel each layer of PCB design one by one, to have a detailed look at the components. This gives separate views of components, silverscreen, solderMask, copper, etc. You can also perform various actions with mouse scroll actions after pressing respective buttons for them, such as: Zoom (F5), Peel (F6), and Spread (F7). You can selectively view/hide components, silkscreen, soldermask, and copper. Another option lets you view free/blank space in the design board. You can view the design as wireframe, edit object colors, view as X-ray, or as typical CAD drawing. A report with details of components, pins, nets, PCB nodes, IPC nodes, and errors can be generated. Viewplot is a paid GRB editor, which lets you view Gerber files for free. It gives you a good layer wise view of Gerber files. Each layer is displayed in different colors, and selecting a layer gives a highlighted view of it. Options let you add text, circle, arc, rectangle and other shapes, but the file cannot be saved. Grid view can be turned on/off, and diagram dpi can be changed to 300, 360, 600, 720, 1000, 1200, 1440, 2000, or 2400. DFM Now lets you have a detailed look on Gerber files. You can easily get top and bottom view of drawings with this Gerber viewer. All layers of files can be viewed easily and you can separately choose each layer to show/hide. A slider zoom makes viewing Gerber file easy. Other options let you make the board translucent, and view component info when clicked. You can also easily move, delete, rotate, mirror, and flip components. If you want, you can also add trace, circle, arc, polygon, and text to the drawing, but you cannot save the file; however, you can take a printout of the file. If there is an error in the PCB design, you can generate PDF and Excel error reports. GerbEx is an open source Gerber viewer with simple viewing options. Zoom and move the drawing to view GRB file properly. This software lets you play around with layers of the loaded design. Each layer is represented in different color, and you can hide/unhide layers and duplicate layers. 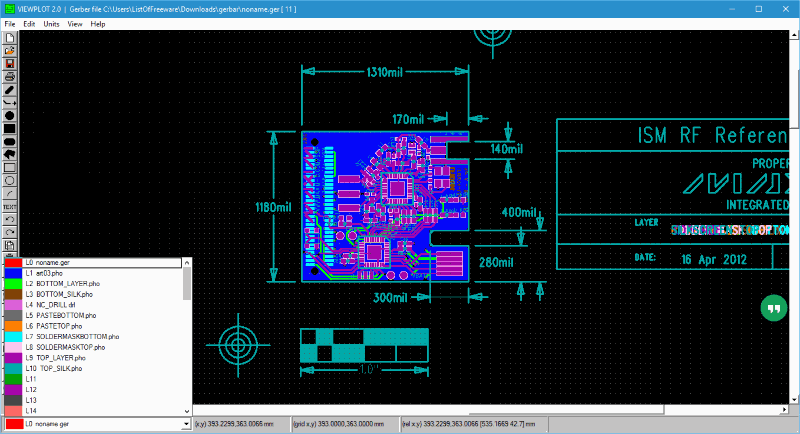 Use FlatCam as a Gerber viewer software or as a Gerber editor to edit PCB board or create one from scratch. It gives you a layer wise view of designs. You can select a component to view its property and also measure distance between two components in mm or inch. It also lets you isolate routing, board cutout, and non-copper region for a detailed view. A Gerber file opens as project, which can be edited if you want. Add arc, rectangle, polygon, path, and merge polygons. A built-in tool lets you create double sided PCB by inverting layers. 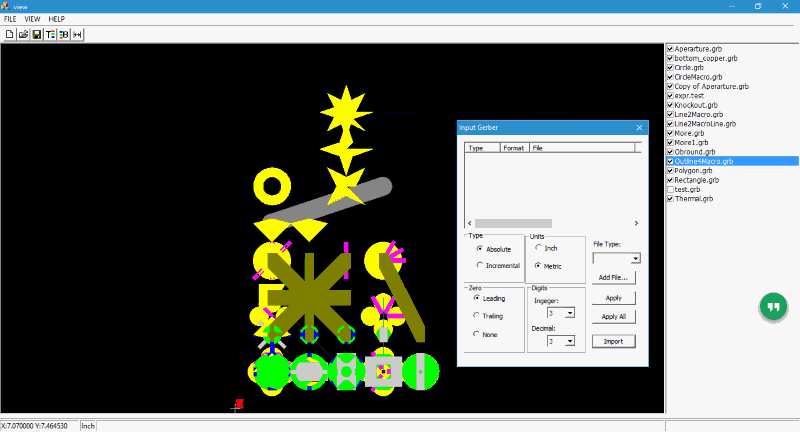 It also features a script tool, known as TCL console, which helps users to implement their own features to PCB designs. Here you can view GRB and G-code files. Designs can be exported as SGV files. LayoutEditor is a simple free Gerber editor which can be used to view Gerber files. 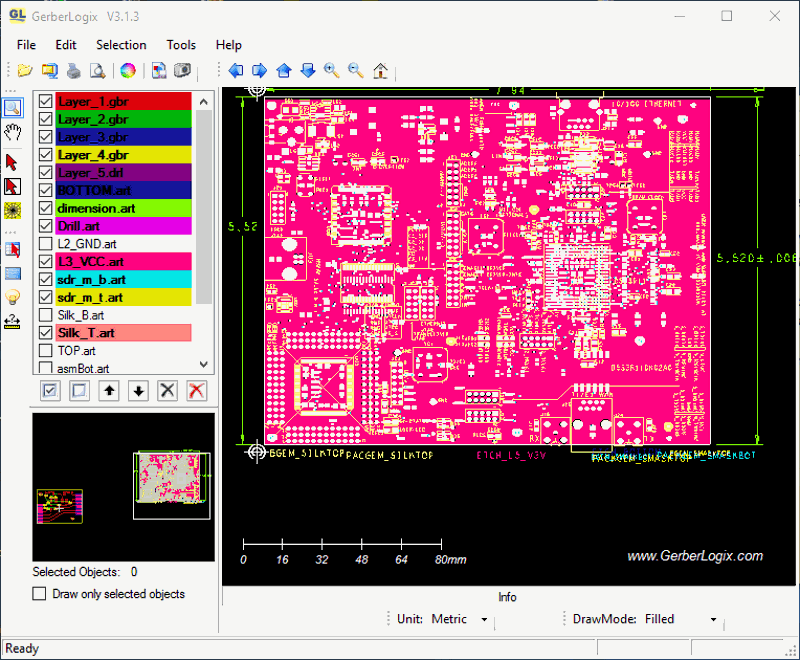 Layers of PCB design can be selectively viewed and you can also use the zoom feature for enhanced view. Options to move and rotate objects is available. Measure tool lets you measure distance between two objects. It has extensive options available for editing Gerber files. Add path, box, polygons, cell, text, etc. 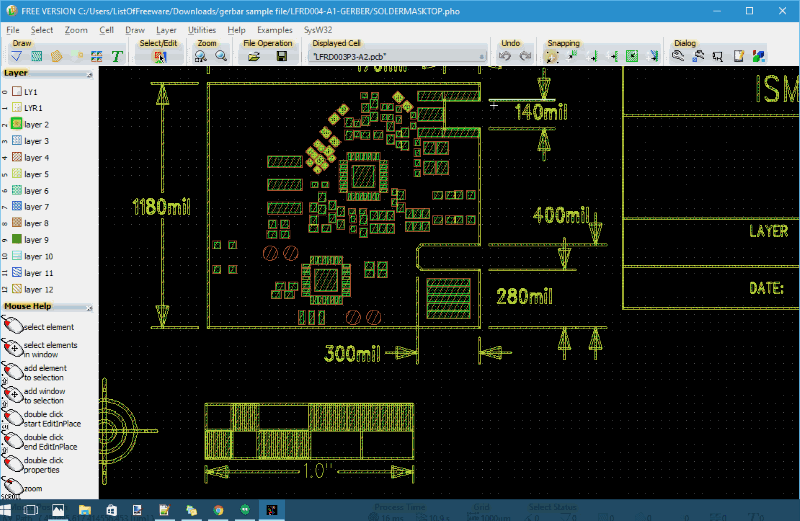 to the PCB design. Layers can be copied, deleted, added, mirrored, and merged. Components can be added and component size can be altered as well with this Gerber viewer. You can open and edit following design files: gds, dfx, cif, Gerber layout, svg, cvs, odb++, ger, gerber, gbx, art, pho, etc. Search shapes in Gerber files. Generate component list in CSV.